Established in 2009, Goldwind Australia offers comprehensive wind power solutions, including investment, construction, and operational and maintenance services. Goldwind Australia is a wholly owned subsidiary of Xinjiang Goldwind Science & Technology; a leading vertically integrated global wind power company offering comprehensive wind power solutions. Goldwind, established in 1998, is an international enterprise specializing in wind turbine generators, R&D and manufacturing of its innovative leading edge wind turbine technology; PMDD. In 2007, Goldwind undertook an initial public offering and listing of A Shares on the Shenzhen Stock Exchange (SZSE:002202). In 2010, the company listed on the Main Board of the Hong Kong Stock Exchange (HK Stock Code: 2208). For Goldwind corporate updates, please see here. As a leading comprehensive wind power solutions provider in China and abroad, Goldwind continues to compete with a strategy for long-term development, prioritizing product quality and seeking to meet varied demands of all our customers. At the end of 2016, the Group’s accumulated installed capacity exceeded 38GW comprised over 25,862 units of installed WTGs worldwide. Goldwind International was formed in Hong Kong in January 2011 with HK$20 million in capital. As a wholly-owned subsidiary of Xinjiang Goldwind Science & Technology Co., Ltd., Goldwind International consists of 7 regional centers: Goldwind Australia, Goldwind America, Goldwind South America, Goldwind Asia, Goldwind Europe and Goldwind Africa to consistently offer intergrated solutions for meeting the various challenges and requirements to the global market. Commitment to Technical Expertise and Quality. 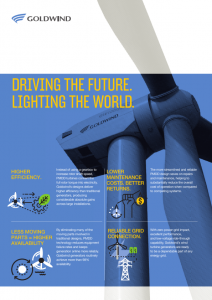 Through our extensive global network of companies and the longevity of our energy and finance professionals, Goldwind Australia offers a comprehensive menu of services including R&D, project development, turbine manufacturing, project management and after-sales services – we are focused yet integrated. To ensure the highest quality of our products at all times, we are dedicated to expand and leverage our technical expertise internationally. Commitment to Global Innovation for a Brighter Future. Building upon our strong foundation rooted in wind power solutions and permanent magnetic direct-drive expertise, we continue to explore the potential to combine wind power with other forms of renewable energy. This includes the pursuit and development of wind and solar power generation, smart micro-grids, energy savings, and technical and operational solutions. Providing clean, cost efficient renewable energy is an urgent, global imperative. Goldwind is dedicated to furthering the most advanced and cost-efficient wind power projects, continually raising the bar through a steadfast commitment to innovation. Commitment to Quality, Health, Safety and the Environment. Goldwind Australia is committed to the development of sustainable and balanced environmental projects across a wide suite of portfolios and services, and the provision of a safe and healthy work environment for all workers, contractors and visitors. The management team have strived for the establishment of an integrated management system that underpins the range of services provided and has undergone external third party assessment and certification to internationally recognised standards.